London was recently abuzz with fashionable globetrotters and high-tech influencers who were amping up their chat-up lines at the much-talked-about exhibition, Christian Dior: Designer of Dreams at the Victoria & Albert Museum (V&A). 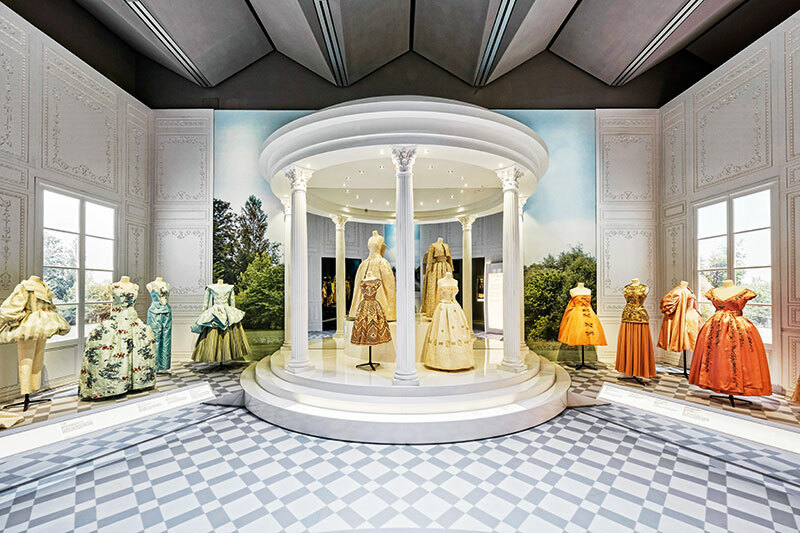 The extensive showcase commemorates the house’s journey from the time that Christian Dior founded the brand in 1946, mapping his early impact and immense influence, right up to the present. It also showcases the roles of the six artistic directors who succeeded this legendary designer. These include Yves Saint Laurent (who created a stir with his androgynous style statements), Marc Bohan (who refreshed the ’70s scene with his classic, conservative approach), Gianfranco Ferré, (flamboyant and eager to break boundaries), John Galliano (who had an irrepressible exuberance), Raf Simons (who projected a minimalist avant-garde vision) and the current creative director, the elegant Maria Grazia Chiuri, the first woman to lead the fashion house since its foundation. The retrospective explores a new aspect of Dior’s relationship with Britain, his passion for exotic travel and horticulture, and the global success of his haute couture fashion house as also the now-iconic Miss Dior fragrance. The exhibits also showcase more than 200 rare, eye-catching garments, accessories, fashion photographs, films, vintage perfumes, original make-up, illustrations, magazines, and Dior’s personal possessions. A confirmed Anglophile, ‘Christian D’ adored dressing in Savile Row suits and launched his first store in London in 1952. At his premier fashion show at the city’s Savoy Hotel, he had said, “I love English traditions, English politeness, English architecture. I even love English cooking.” The exhibition further delves into his collaborative endeavours with British manufacturers including Dents (gloves) Rayne London (shoes) Lyle & Scott (knitwear) and Mitchel Maer (costume jewellery), and his intriguing rapport with the late Princess Margaret, Countess of Snowdon. She put the designer in the spotlight and grabbed headlines when she wore his Cinderella ball gown for her 21st birthday celebrations in 1951. Dior’s young days were spent in a house by the sea in Granville, Normandy. He developed a fascination with gardens, as he had grown up seeing his mother lovingly cultivate one in their home. He drew on that for his design vision and used a lot of flowers — which later became emblematic of his brand, often completing a total look with intricately embellished hats and luxurious shoes. In 1947, Dior launched his own fashion house with his cutting-edge The New Look collection, thereby forever changing the way fashion was perceived. His Bar suit (inspired by the bar at the Hotel Plaza Athénée in Paris), presented in his first collection (1947), conjured up a new sculpted feminine form which emphasised the natural curves of a woman’s body. The New Look line had two stand-out silhouettes — Corolle and En Huit. The Corolle shape featured voluptuous A-line skirts inspired by the petals or corollas of flowers, and the En Huit line was characterised by sharp hip-hugging pencil skirts. Both styles featured ample busts; corseted, nipped waistlines and soft, rounded shoulders. Very quickly, Monsieur Dior had cast his spell, and his followers started excitedly debating hemline lengths, waist placements and cleavage shapes in anticipation of each season. As this breakthrough came after the end of World War II, his ensembles became a sensational success, depicting a marked deviation from wartime austerity. 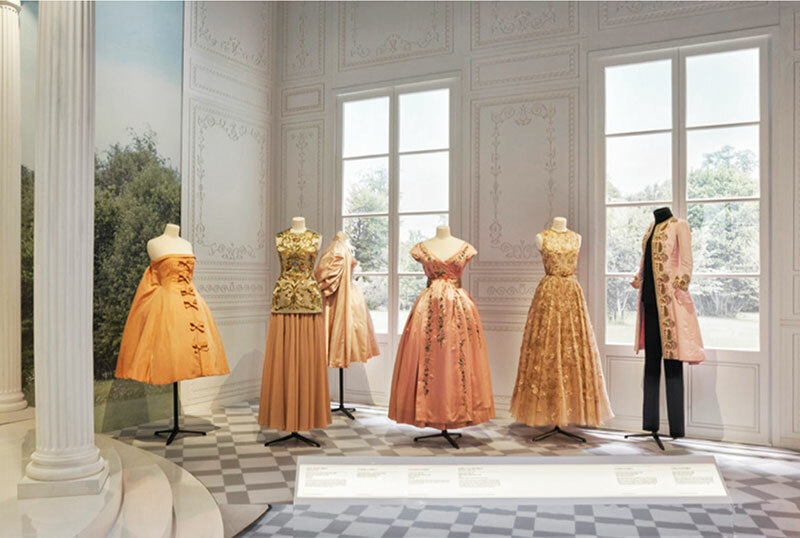 Dior had an uncompromising, abundant view of luxury, and his extravagant ball gowns were loved for their skillful drapes, delicate and intricate embroidery and their use of the finest materials and embellishments. An enchanting example on view at the museum is the Shalimar dress in glittering black and gold, designed by Gianfranco Ferré for the Autumn Winter 1996 collection. Inspired by the sari, the dress is made of silk chiffon, metal thread, sequins and Swarovski crystals. The net and Perspex headdress that complements the outfit was designed by radical milliner, Stephen Jones. On the VIP preview night, the foyer of the museum epitomised glamour at its peak, weaving together fashion and style with an element of magical surprise — dedicated to the iconic stalwart who started this phenomenon. My fairy-tale moment came when I met the creative director, Chiuri and her charming daughter, Rachele Regini. We chatted about Chiuri’s frequent visits to Mumbai and her fascination for India. Following Dior’s aesthetics, Chiuri had left a lasting impression with dresses made from hand-dyed silk petals caught like delicately pressed flowers between soft layers of silk tulle for her first collection. She has spoken out about how, as time evolves, artistic designers will have to reach out to audiences and be more affable. Christian Dior was a pioneering dreamer who led innovative creations and built an invaluable, universal brand. His successors have harnessed the unrivalled skills of his couture, using traditional ateliers to constantly create new visions of his style, championing hard to triumphantly keep the house synonymous with luxury, allure and opulence. What are the challenges of your job as a curator at the V&A? Working with textiles and dresses can often bring its own challenges centred around display, especially with reference to historic pieces, as each object needs a custom-made support or mannequin. It’s less straightforward than working with 2D objects. How do you feel about the response to the Dior exhibition? It is great that the show has had such a positive response. In order to realise the project, we worked with a very dedicated team of people in what was a short window of time for such a major exhibition. Lots of people from the management and mount-making to the press department have worked incredibly hard and given a lot to the project, so it’s brilliant and it has been received well. 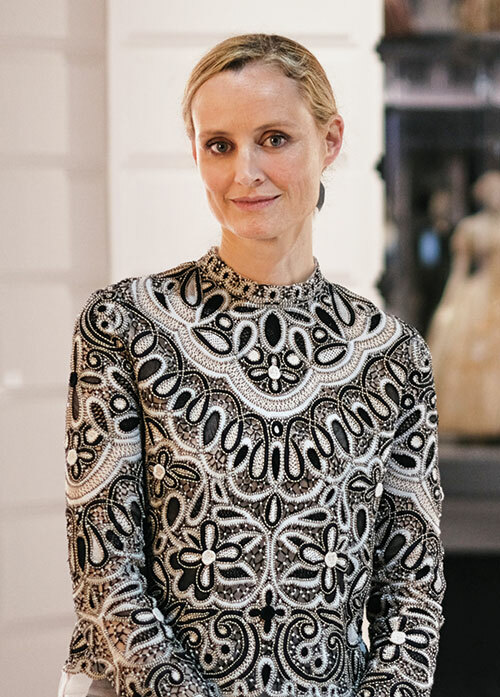 You have authored volumes on the history of a dress and written biographies on British designers and their muses. What was the challenge you faced while working on the book on Christian Dior? The book that we put together is a souvenir catalogue for the show. The main challenge was timing — writing it while curating the show, within such a tight deadline. We were very fortunate to work with photographer Laziz Hamani, who captured the images of many of the dresses featured in the book. How does fashion draw inspiration from art? Fashion has always drawn from art, but I think today there is definitely a mutual inspiration. Many artists are inspired by the world of fashion just as much as fashion designers are inspired by art. And in recent years, we have seen collaborations between the two as well. What does a designer need to do to catch your eye? They must have a unique point of view, whether it’s their source of inspiration, use of materials or a particular aesthetic. It must be something that makes them instantly identifiable and stand out from the crowd. We are very lucky to be able to work with young designers for our Fashion in Motion programme and their energy and determination is always inspiring. After 17 years with Valentino, what influenced you to join Christian Dior? As a designer, I have always admired the brand. Its timeless references and beauty are central to fashion history. 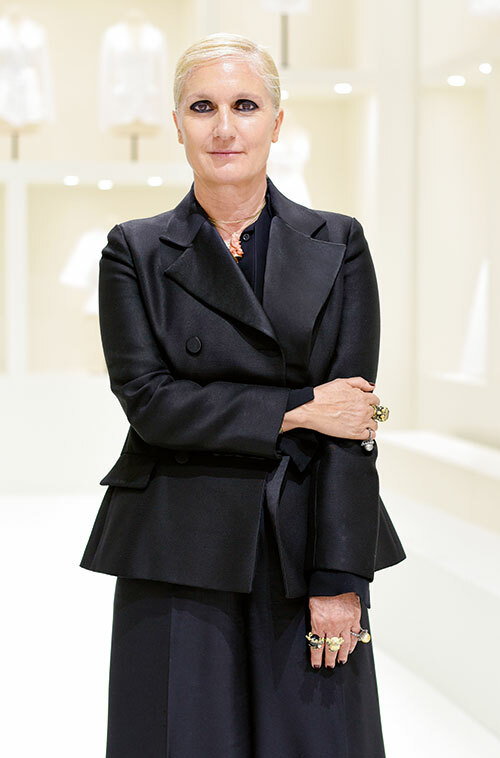 My move to Dior marked an important time for me. I relocated to Paris and started all over again in a new city; I wanted to take this test to see where it would lead me, both personally and creatively. What are your biggest challenges as creative director? I think one of the longstanding challenges is to transmit the beauty of the archives and the history of the brand in a new and contemporary way. Drawing young people to the brand is one of my key goals. I want to speak to the new generation of women. What do you think is the most important facet while designing a garment? It is very important that clothing remains practical while being complex. I want women to be able to wear the clothes I design, no matter what they wish to do or what their lifestyles may be. They should be able to adapt the outfits to their lives. What, in your opinion, excites millennial shoppers? I think individuality in a world of intense image saturation is important. They want to stand out and be individuals in their own right. Clothing is essential in conveying this well. It can really function as a tool for self-expression. How important are accessories in putting an ensemble together? They add character to an outfit. They complement the style of the clothing and also add charisma and attitude. The same dress worn with different shoes, for instance, can change a look completely. What are your thoughts on the Christian Dior: Designer of Dreams exhibition? I love the show and its focus on the relationship between Dior and Britain. It was fascinating to see some of the dresses which belong to the archives of British collections and collectors. The curator, Oriole Cullen, has done an outstanding job of conveying the essence of both French and British tastes. At the VIP preview at the museum, you mentioned that you enjoyed visiting Mumbai and travelling around India…. I am fascinated by India and I have been lucky enough to work with people from the embroidery sector. I am very close to Vinod Maganlal Shah, Monica Shah and Karishma Swali, the family that runs Chanakya International Private Limited, an export house that provides niche luxury embroidery and embellishment services to some of the world’s biggest haute couture labels. I have known them since the beginning of my career. I was recently in Mumbai to celebrate their opening of a school of embroidery for women; and I’ve been to Mumbai and Rajasthan twice. I have also visited the Kutch region. It’s an intriguing place full of tradition and positive energy and I hope I get a chance to return soon. What has inspired your collection for 2019? For the next collection, I’ve taken inspiration from the opening of the Dior exhibition at the London museum. I can’t reveal any more at the moment as it is still a work in progress!